The duo will go toe-to-toe in the first box­ing programme for the year under the South Pacific Boxing Promotions banner at Prince Charles Park in Nadi. Sorokoba, Ba native Savenaca Naliva is set for his biggest fight when he faces Joseph Kwadjo today. During the first weigh-in yesterday Nali­va, 30, tipped the scale at 84.3 kilogrammes while Kwadjo weighed 80.4kg. Naliva has to shed more weight before the light heavyweight title fight today. He adamant of making the right weight as this fight has been long overdue. “It is an important fight as it is a title fight; it won’t be an easy one,” he said. “Preparation has been going well for the past months. Kwadjo said: “It is going to be a good fight as we’ve been training hard for this. “My team and I have something special planned. Kwadjo added their fight is not a mis­match. “This is not a mismatch. 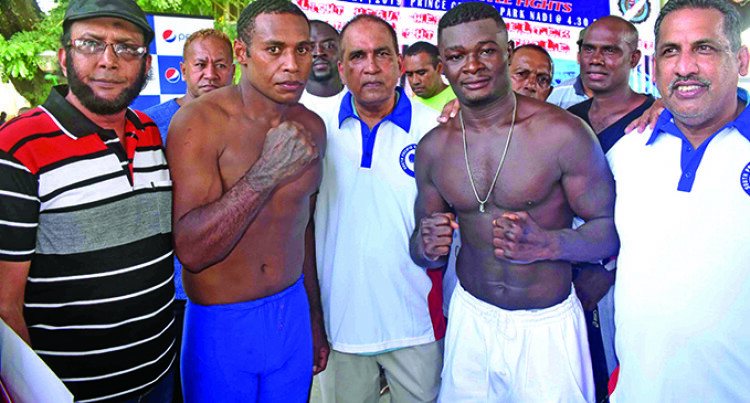 Naliva has inter­national exposure and has fought good box­ers locally,” he said. Furthermore, another interesting fight is between Katrina Singh and Virisila Koli­tapa. Boxing Commission of Fiji director Us­man Ali said the fight is on. However, he confirmed that Ronald Naidu who was scheduled to meet Rakuro Dau­nivavana in a welterweight title fight, has presented a medical certificate. Promotions director Mohammed Sha­meem is looking forward to the main bout. “The fans should come out in numbers as this is the first title fight in 2019. This is a must see programme and the boxers need their support,” he said. Petero Qica – Isikeli Navuni, Soropepeli Vuniyayawa – Filimoni Naliva, Joseva Ra­vudi – Isikeli Senidoko, Rupeni Rasaku – Apisai Naciqa, Semisoni Hanimo – Mater­eti Canavanua. Ladies bout: Katrina Singh – Virisila Kolitapa.